The upper extremity is defined as the anatomic region distal to the deltoid muscle. This area is composed of the arm, anatomic structures from the shoulder to the elbow; the forearm, anatomic structures from the elbow to the wrist; and the hand, anatomic structures distal to the wrist. Early methods for treating bleeding vessels included the use of chemical styptic, cauterization, and ligation. Ligature of major arteries was the mainstay treatment during extremity amputation throughout the 18th century. In the past several decades, most surgical experience has come from the civilian population. The incidence of vascular injuries has risen due to the increased rates of automobile accidents, firearm-related urban violence, and the expansion of interventional cardiovascular diagnostic and therapeutic procedures. One modern study of upper extremity vascular injury reported a primary amputation rate of 5.7% and a secondary amputation rate (amputation following primary revascularization procedure) of 8.2%. More recent wartime data collected during the Iraqi conflict (Operation Iraqi Freedom) demonstrate an upper extremity amputation rate of 9.3%. This increased rate of upper extremity amputation may reflect the devastating impact of improvised explosive devices (IEDs) rather than changes in surgical techniques and treatment methods. Modern series continue to demonstrate low mortality rates and upper extremity amputation rates of 0.8-2% for civilian penetrating trauma and 6-24% for civilian blunt trauma. The mortality rate of patients with upper extremity vascular trauma is primarily related to other associated severe injuries (eg, closed-head injuries, intra-abdominal trauma). Morbidity related to upper extremity vascular injuries frequently correlates with associated injuries, such as peripheral nerve injury and/or long bone fracture. The most common cause of upper extremity vascular injury is penetrating trauma secondary to gunshot wounds, stab wounds, and lacerations from broken glass. However, iatrogenic trauma secondary to the widespread use of diagnostic and therapeutic intravascular techniques has also contributed to an increased incidence of upper extremity vascular injury. Although vascular injury following blunt trauma of the upper extremity is less common, it deserves emphasis because it can be easily overlooked unless the clinician maintains a high index of suspicion. This type of injury is more commonly seen after automobile accidents and athletic injuries, most of which result in intimal tears and subsequent thrombosis of the vessels. Arterial anatomy of the upper extremity. a = artery; br = branch. These obvious signs almost always indicate an underlying arterial injury and are indications for immediate surgical intervention. These soft, or equivocal, signs may indicate the need for further evaluation with Doppler studies, CT angiography, contrast arteriography, or surgical exploration to confirm or exclude vascular injury. Note that a palpable radial pulse does not exclude a proximal vascular injury. The rich collateral networks around the shoulder and elbow in combination with the paired major vessels at the forearm may result in normal physical findings though an underlying arterial injury may be present. At this point, the ulnar artery occlusive pressure is released while maintaining occlusive pressure on the radial artery. The time required for capillary refill of the palmar skin is noted. The test is then repeated releasing the radial arterial occlusion while maintaining occlusion of the ulnar artery (the inverse modified Allen's test). Return of color to the palmar skin should occur in 5-10 seconds for the test to be considered negative (implying an intact palmar arch). Glavin and Jones compared the modified Allen's test with Doppler ultrasonography in 75 patients and found that 80% of all abnormal modified Allen's test results in their study were incorrect. These results would suggest that patients with an abnormal or positive modified Allen's test result should have more objective studies performed to determine the true anatomy of the superficial and deep arterial system in the hand. Despite this, no standard criteria for Doppler ultrasonographic findings that define abnormal hand collateral perfusion are established. Vascular injuries of the upper extremity are defined as those occurring distal to the lateral border of the first rib. The axillary artery is a continuation of the subclavian artery and extends from the lateral margin of the first rib to the lateral margin of the teres major muscle. It is divided into 3 segments by the pectoralis minor muscle and gives off 6 arterial branches that contribute to the rich collateral circulation around the shoulder girdle (see image below). These branches are the superior thoracic, thoracoacromial, lateral thoracic, subscapular, and anterior and posterior circumflex arteries. The close proximity of the axillary artery to the axillary vein and brachial plexus provides the anatomic basis for the development of arteriovenous fistulas and high incidence of concomitant nerve injuries. The brachial artery is a continuation of the axillary artery. It begins at the lateral margin of the teres major muscle and terminates one inch below the elbow crease at its bifurcation. The profunda brachii, superior ulnar collateral, and inferior ulnar collaterals are the main arterial branches of the brachial artery. These vessels provide important collateral circulation around the elbow (see image above). In the distal aspect, the brachial artery lies next to the median nerve. The relatively superficial and exposed location of the vessel makes it highly susceptible to injury. Within the forearm the brachial artery bifurcates into the radial and ulnar arteries. 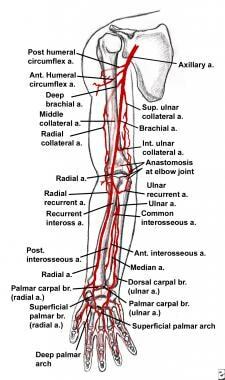 The main arterial branches, which contribute to the collateral network around the elbow, include the radial recurrent a. originating off the radial artery, the ulnar recurrent a. and the interosseous a. originating from the ulnar artery. The radial and ulnar arteries course through the forearm and terminate as the deep and superficial palmar arches, respectively. The ulnar artery is the larger of the two vessels and the major source of blood flow to the digits. As mentioned previously, the superficial arch is incomplete in approximately 20% of patients. Fields CE, Latifi R, Ivatury RR. Brachial and forearm vessel injuries. Surg Clin North Am. 2002 Feb. 82(1):105-14. [Medline]. Velmahos GC, Toutouzas KG. Vascular trauma and compartment syndromes. Surg Clin North Am. 2002 Feb. 82(1):125-41, xxi. [Medline]. Friedman SG. Early vascular repairs and anastomoses. A History of Vascular Surgery. 2nd ed. Massachusetts: Blackwell-Futura; 2005. 14-30. Layton TR. Stonewall Jackson's wounds. J Am Coll Surg. 1996 Nov. 183(5):514-24. [Medline]. Rich NM, Spencer FC. Brachial artery injuries. Rich NM, Spencer FC. Vascular Trauma. Philadelphia, Pa: WB Saunders; 1978. 348-68. Mattox KL, Feliciano DV, Burch J, Beall AC Jr, Jordan GL Jr, De Bakey ME. Five thousand seven hundred sixty cardiovascular injuries in 4459 patients. Epidemiologic evolution 1958 to 1987. Ann Surg. 1989 Jun. 209(6):698-705; discussion 706-7. [Medline]. [Full Text]. Clouse WD, Rasmussen TE, Perlstein J, Sutherland MJ, Peck MA, Eliason JL, et al. Upper extremity vascular injury: a current in-theater wartime report from Operation Iraqi Freedom. Ann Vasc Surg. 2006 Jul. 20(4):429-34. [Medline]. Klocker J, Falkensammer J, Pellegrini L, Biebl M, Tauscher T, Fraedrich G. Repair of arterial injury after blunt trauma in the upper extremity - immediate and long-term outcome. Eur J Vasc Endovasc Surg. 2010 Feb. 39(2):160-4. [Medline]. Bongard F, Dubrow T, Klein S. Vascular injuries in the urban battleground: experience at a metropolitan trauma center. Ann Vasc Surg. 1990 Sep. 4(5):415-8. [Medline]. van der Sluis CK, Kucey DS, Brenneman FD, Hunter GA, Maggisano R, ten Duis HJ. Long-term outcomes after upper limb arterial injuries. Can J Surg. 1997 Aug. 40(4):265-70. [Medline]. Joshi V, Harding GE, Bottoni DA, Lovell MB, Forbes TL. Determination of functional outcome following upper extremity arterial trauma. Vasc Endovascular Surg. 2007 Apr-May. 41(2):111-4. [Medline]. Dragas M, Davidovic L, Kostic D, Markovic M, Pejkic S, Ille T, et al. Upper extremity arterial injuries: factors influencing treatment outcome. Injury. 2009 Aug. 40(8):815-9. [Medline]. Gardiner GA Jr, Tan A. Repetitive Blunt Trauma and Arterial Injury in the Hand. Cardiovasc Intervent Radiol. 2017 Nov. 40 (11):1659-68. [Medline]. Jackson MR. Upper extremity arterial injuries in athletes. Semin Vasc Surg. 2003 Sep. 16(3):232-9. [Medline]. Smith HE, Dirks M, Patterson RB. Hypothenar hammer syndrome: Distal ulnar artery reconstruction with autologous inferior epigastric artery. J Vasc Surg. 2004 Dec. 40(6):1238-42. [Medline]. Bravman JT, Ipaktchi K, Biffl WL, Stahel PF. Vascular injuries after minor blunt upper extremity trauma: pitfalls in the recognition and diagnosis of potential "near miss" injuries. Scand J Trauma Resusc Emerg Med. 2008 Nov 25. 16(1):16. [Medline]. [Full Text]. Ejrup B, Fischer B, Wright IS. Clinical evaluation of blood flow to the hand. The false-positive Allen test. Circulation. 1966 May. 33(5):778-80. [Medline]. Greenhow DE. Incorrect performance of Allen’s test-ulnar artery flow erroneously presumed inadequate. Anesthesiology. 1972. 37:356-7. Jarvis MA, Jarvis CL, Jones PR, Spyt TJ. Reliability of Allen's test in selection of patients for radial artery harvest. Ann Thorac Surg. 2000 Oct. 70(4):1362-5. [Medline]. Glavin RJ, Jones HM. Assessing collateral circulation in the hand--four methods compared. Anaesthesia. 1989 Jul. 44(7):594-5. [Medline]. Barbeau GR, Arsenault FA, et al. Evaluation of the ulnopalmar arterial arches with pulse oximetry and plethysmography: comparision with the Allen’s test in 1010 patients. Am Heart J. 2004. 147:489-93. Lawson D, Norley I, Korbon G, Loeb R, Ellis J. Blood flow limits and pulse oximeter signal detection. Anesthesiology. 1987 Oct. 67(4):599-603. [Medline]. Fuhrman TM, Reilley TE, Pippin ED. Comparision of digital blood pressure, plethysmography, and the modified Allen’s test as means of evaluating the collateral circulation to the hand. Anaesthesia. 1992. 47:959-61. Busquéts AR, Acosta JA, Colón E, Alejandro KV, Rodríguez P. Helical computed tomographic angiography for the diagnosis of traumatic arterial injuries of the extremities. J Trauma. 2004 Mar. 56(3):625-8. [Medline]. Meissner M, Paun M, Johansen K. Duplex scanning for arterial trauma. Am J Surg. 1991 May. 161(5):552-5. [Medline]. Mollberg NM, Wise SR, Banipal S, Sullivan R, Holevar M, Vafa A, et al. Color-Flow Duplex Screening for Upper Extremity Proximity Injuries: A Low-Yield Strategy for Therapeutic Intervention. Ann Vasc Surg. 2013 Feb 11. [Medline]. Seamon MJ, Smoger D, Torres DM, Pathak AS, Gaughan JP, Santora TA, et al. A prospective validation of a current practice: the detection of extremity vascular injury with CT angiography. J Trauma. 2009 Aug. 67(2):238-43; discussion 243-4. [Medline]. Peng PD, Spain DA, Tataria M, Hellinger JC, Rubin GD, Brundage SI. CT angiography effectively evaluates extremity vascular trauma. Am Surg. 2008 Feb. 74(2):103-7. [Medline]. Soto JA, Múnera F, Morales C, Lopera JE, Holguín D, Guarín O, et al. Focal arterial injuries of the proximal extremities: helical CT arteriography as the initial method of diagnosis. Radiology. 2001 Jan. 218(1):188-94. [Medline]. Bogdan MA, Klein MB, Rubin GD, McAdams TR, Chang J. CT angiography in complex upper extremity reconstruction. J Hand Surg [Br]. 2004 Oct. 29(5):465-9. [Medline]. Frykberg ER, Crump JM, Dennis JW, Vines FS, Alexander RH. Nonoperative observation of clinically occult arterial injuries: a prospective evaluation. Surgery. 1991 Jan. 109(1):85-96. [Medline]. Waller CJ, Cogbill TH, Kallies KJ, et al. Contemporary management of subclavian and axillary artery injuries-a Western Trauma Association multicenter review. J Trauma Acute Care Surg. 2017 Dec. 83 (6):1023-31. [Medline]. Rothkopf DM, Chu B, et al. Radial and ulnar artery repairs: assessing patency rates with color Doppler ultrasonographic imaging. J Hand Surg. 1993. 18A:626-8. Gelberman RH, Nunley JA, et al. The results of radial and ulnar arterial repair in the forearm. Experience in three medical centers. J Bone Joint Surg Am. 1982. 64:383-87. Johnson M, Ford M, Johansen K. Radial or ulnar artery laceration. Repair or ligate?. Arch Surg. 1993 Sep. 128(9):971-4; discussion 974-5. [Medline]. Schippers SM, Hajewski C, Glass NA, Caldwell L. Single Forearm Vessel Injury in a Perfused Hand: Repair or Ligate? A Systematic Review. Iowa Orthop J. 2018. 38:159. [Medline]. [Full Text]. Feliciano DV, Mattox KL, Graham JM, Bitondo CG. Five-year experience with PTFE grafts in vascular wounds. J Trauma. 1985 Jan. 25(1):71-82. [Medline]. Castelli P, Caronno R, Piffaretti G, Tozzi M, Laganà D, Carrafiello G, et al. Endovascular repair of traumatic injuries of the subclavian and axillary arteries. Injury. 2005 Jun. 36(6):778-82. [Medline]. Danetz JS, Cassano AD, Stoner MC, Ivatury RR, Levy MM. Feasibility of endovascular repair in penetrating axillosubclavian injuries: a retrospective review. J Vasc Surg. 2005 Feb. 41(2):246-54. [Medline]. Raskin KB. Acute vascular injuries of the upper extremity. Hand Clin. 1993 Feb. 9(1):115-30. [Medline]. Konstantiniuk P, Fritz G, Ott T, Weiglhofer U, Schweiger S, Cohnert T. Long-term follow-up of vascular reconstructions after supracondylar humerus fracture with vascular lesion in childhood. Eur J Vasc Endovasc Surg. 2011 Nov. 42(5):684-8. [Medline]. Klocker J, Peter T, Pellegrini L, Mattesich M, Loescher W, Sieb M, et al. Incidence and predisposing factors of cold intolerance after arterial repair in upper extremity injuries. J Vasc Surg. 2012 Aug. 56(2):410-4. [Medline]. Frech A, Pellegrini L, Fraedrich G, Goebel G, Klocker J. Long-term Clinical Outcome and Functional Status After Arterial Reconstruction in Upper Extremity Injury. Eur J Vasc Endovasc Surg. 2016 Jul. 52 (1):119-23. [Medline]. Endress RD, Johnson CH, Bishop AT, et al. Hypothenar hammer syndrome: long-term results of vascular reconstruction. J Hand Surg Am. 2015 Apr. 40(4):660-665.e2. [Medline]. Alves K, Spencer H, Barnewolt CE, Waters PM, Bae DS. Early Outcomes of Vein Grafting for Reconstruction of Brachial Arterial Injuries in Children. J Hand Surg Am. 2018 Mar. 43 (3):287.e1-e7. [Medline]. Wegmann H, Eberl R, Kraus T, et al. The impact of arterial vessel injuries associated with pediatric supracondylar humeral fractures. J Trauma Acute Care Surg. 2014 Aug. 77(2):381-5. [Medline]. Delniotis I, Delniotis A, Saloupis P, et al. Management of the Pediatric Pulseless Supracondylar Humeral Fracture: A Systematic Review and Comparison Study of "Watchful Expectancy Strategy" Versus Surgical Exploration of the Brachial Artery. Ann Vasc Surg. 2019 Feb. 55:260-71. [Medline]. Cambon-Binder A, Jehanno P, Tribout L, et al. Pulseless supracondylar humeral fractures in children: vascular complications in a ten year series. Int Orthop. 2018 Apr. 42 (4):891-9. [Medline]. Kirkwood ML, Chamseddin KH, Hanson B, et al. Continued Ultrasound Surveillance Required after Hand Ischemia Associated with Trauma in Children. Ann Vasc Surg. 2018 Aug. 51:119-23. [Medline]. Arteriogram demonstrates obstruction of flow in the upper extremity. Decompression of fascial compartments (fasciotomy). Prolonged limb ischemia resulting in tissue necrosis. Amputation of a hand because of tissue necrosis. The authors and editors of Medscape Reference gratefully acknowledge the contributions of previous authors Nadeem Chaudhry, MD, FACS, Khaled F Salhab, MD, and Ian C Marrero, MD, to the development and writing of this article.